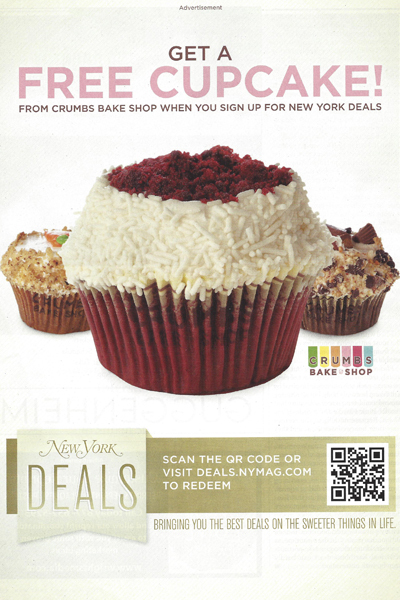 New York Magazine together with Crumbs Bake Shop launched a campaign where consumers get a free cupcake when they scan the magazine ad's QR Code and sign up for the New York Deals program, which is a list of deals and offers emailed daily. This is the first time for New York Magazine to use QR codes for marketing. The goal is to promote the magazine’s New York Deals program and get people to sign up with the offer of a free delicious cupcake from Crumbs Bake Shop. “For the New York Deals promotion with Crumbs we wanted to make sure we leveraged the print magazine as well as our digital properties,” said a project manager of business development at New York Magazine. KFC (Kentucky Fried Chicken) recently introduced Li'l Bucket Kids Meals. The outside of the small bucket is designed with fun stuff such as puzzles, riddles, pictures and a QR code. 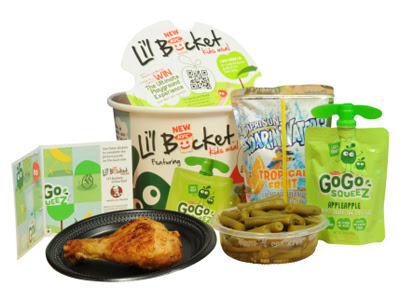 “Including the QR code on Li’l Bucket Meals makes it easy for moms to access complete information on the product,” said a senior manager of public relations at KFC Corp., Louisville, KY.
Now many restaurants and consumer packaged goods companies are taking advantage of QR codes that link to more detailed product and nutritional information, hence freeing up valuable packaging space while also taking advantage of the growing smartphone adoption rate.